We support AWStats. What is AWStats? 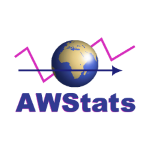 AWStats is a short for Advanced Web Statistics. This log analyzer works as a CGI or from command line and shows you all possible information your log contains, in few graphical web pages. It uses a partial information file to be able to process large log files, often and quickly. It can analyze log files from IIS (W3C log format), Apache log files (NCSA combined/XLF/ELF log format or common/CLF log format), WebStar and most of all web, proxy, wap, streaming servers (and ftp servers or mail logs).